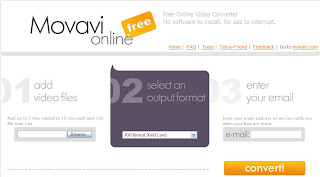 Movavi is another online video converter, that allows you convert video online without any software. Like other online file converter, you need upload your video to its server, choose video format which you want, then put your email address in the bar, click "Convert", that is all you need to do. Next, you just waiting for Movavi notify you if convert all done. Last step is follow its link to download converted file. Input Formats: AVI (DivX, XVid), MPEG (1, 2, 4), MP4, 3gp, 3gp2, WMV, MOV (QT). Another site also offers same service, that called Mux, but it only convert video which from other website, you can not upload your file. If you are interesting about it you can try. 输入: AVI (DivX, XVid), MPEG (1, 2, 4), MP4, 3gp, 3gp2, WMV, MOV (QT).